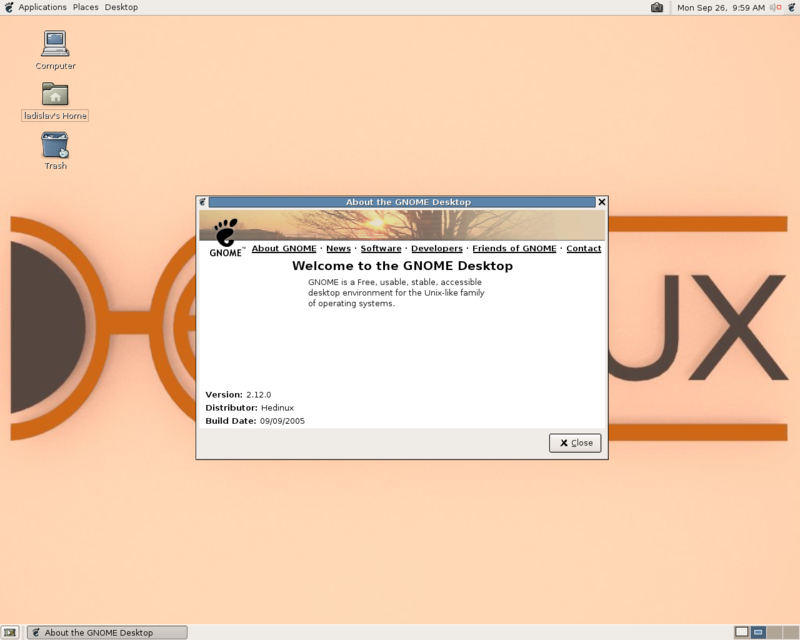 The goal of Hedinux GNU/Linux was to develop an easy-to-use Linux operating system, accessible to all users, irrespective of whether they are computer savvy or not. Hedinux will come in two editions - one for Linux beginners with an intuitive graphical installer and easy system administration tools, while the other will be "from source", designed as a modular system with binary packages built by the user directly from source code. Hedinux was an independently developed distribution inspired by the Linux From Scratch and Beyond Linux From Scratch books. Rate this project Jerry Bezencon has announced the release of a new version of Linux Lite, an Ubuntu-based distribution featuring the Xfce desktop environment. Some key changes in version 4.0 include a new backup utility, replacing home directory encryption with full disk encryption and dropping 32-bit support. "The main changes in Linux Lite Series 4.x include a new icon and system theme, Timeshift for system backups, Shotwell to manage and perform basic edits on images, MenuLibre to manage menu entries, new Lite applications including Lite Desktop that manages common icons on the desktop, Lite Sounds to manage system wide sounds, and many of our existing applications have been updated. See below for all the changes: Minimum recommended specs have been raised slightly to more realistic levels (RAM, CPU). There are no more 32-bit ISO releases. If you still require a 32-bit OS due to hardware limitations, series 3.x is supported through to April 2021. Xfce PulseAudio plugin, has been added to the system tray for highly customizable options regarding volume management. Full disk encryption now replaces home encryption in the installer (an Ubuntu implementation)." Further details and screen shots can be found in the project's release announcement. Download (MD5): linux-lite-4.0-64bit.iso (1,349MB, torrent, pkglist). 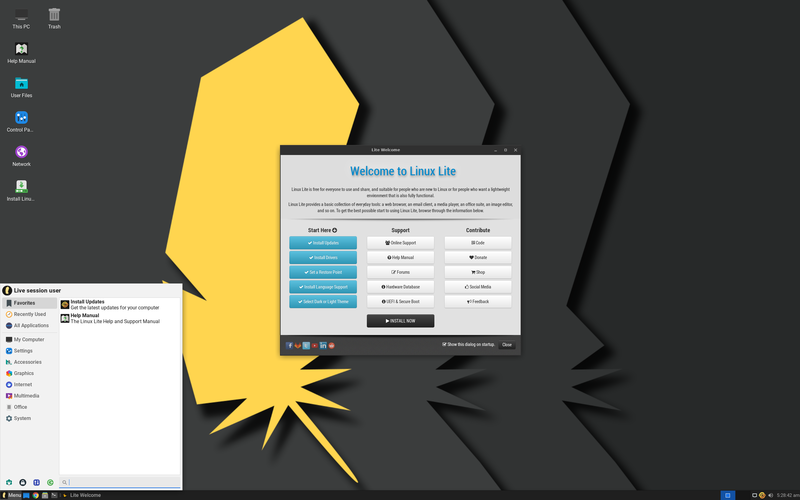 Linux Lite is a beginner-friendly Linux distribution based on Ubuntu's long-term support (LTS) release and featuring the Xfce desktop. The project's latest release, Linux Lite 4.4, offers a number of small updates and improvements as well as updates to key applications. "Moved from betas to RC releases. The RC release's build number is the date of the actual ISO build eg. Build 24022019 - 24th February 2019. The RC information and build number will only appear on the default wallpaper for that release, login screen and the live boot screen. The positioning of the text is such that it allows room for desktop widgets like Conky and Lite Widget to appear uncluttered on the right. Finals will not have any build information on the default wallpaper. Updated the Papirus icon theme to the latest release. Sound Juicer CD ripper has now been added to Lite Software. To get rip-to-mp3 support, Sound Juicer will also install the Restricted Extras package. Volume level - the double level volume bug has been eliminated. Removed all references to Google+ as that service is due to close down on April 2nd 2019." Further details and screenshots can be found in the project's release announcement. Download (MD5): linux-lite-4.4-64bit.iso (1,365MB, torrent, pkglist). Jerry Bezencon has announced the availability of the first release candidate for Linux Lite 4.4, the upcoming new stable version of the project's Ubuntu-based desktop Linux distribution with Xfce as the preferred desktop: "Linux Lite 4.4 RC1 is now available for testing. Yes, that's right, RC1. We have moved off the beta build model to RC releases as these more accurately reflect the build quality of our pre-final images. Linux Lite 4.4 final will be released on 1st April, 2019 New Zealand time. The RC releases build number is the date of the actual ISO image build, e.g. build 24022019 - 24th February 2019. The RC information and build number will only appear on the default wallpaper for that release, Login screen and the Live Boot screen. The positioning of the text is such that it allows room for desktop widgets like Conky and Lite Widget to appear uncluttered on the right. Finals will not have any build information on the default wallpaper. Updated the Papirus icon theme to the latest release. Sound Juicer CD ripper has now been added to Lite Software. To get rip-to-mp3 support, Sound Juicer will also install the Restricted Extras package." See the full release announcement for more information, screenshots and MD5 checksums. Download: linux-lite-4.4-rc1-64bit.iso (1,366MB, torrent, pkglist). Jerry Bezencon has announced the release of Linux Lite 4.2, the latest build of the project's desktop-oriented distribution with Xfce, based on Ubuntu 18.04 LTS. This release sees an addition of Redshift, an application that adjusts the computer display's colour temperature based upon the time of day: "Linux Lite 4.2 final is now available for download and installation. This release has a number of minor changes. Think of it as 'refinement' and not a 'major upgrade'. There are some new wallpapers and some minor tweaks here and there. Redshift has been added to Lite Software. Redshift adjusts the color temperature according to the position of the sun. A different color temperature is set during night and daytime. During twilight and early morning, the color temperature transitions smoothly from night to daytime temperature to allow your eyes to slowly adapt. At night the color temperature should be set to match the lamps in your room. This is typically a low temperature at around 3000K - 4000K (default is 3700K). During the day, the color temperature should match the light from outside, typically around 5500K - 6500K (default is 5500K)." Read the rest of the release announcement for more information and screenshots. Download (MD5): linux-lite-4.2-64bit.iso (1,348MB, torrent, pkglist). Jerry Bezencon has announced that the initial beta build of the upcoming Linux Lite 4.2, a beginner-friendly desktop distribution based on Ubuntu, is now ready for download and testing: "Linux Lite 4.2 beta is now available for testing. This release has a number of minor changes. Think of it as 'refinement' and not a 'major upgrade'. There are some new wallpapers thanks and some minor tweaks here and there. The Help Manual will be updated for 4.2 in the final release. Details: Linux kernel 4.15 (custom kernels also available via our repository for versions 3.13 - 4.18), Firefox 62.0.2 'Quantum', Thunderbird 52.9.1, LibreOffice 6.0.6, VLC 3.0.3, GIMP 2.10.6." There are also several known issues in this release: "Is the slow boot fixed on some computers? That has yet to be tested. I have done some 'under the hood' work on this, but of course, we need testing on real hardware on an array of different computer configurations to know for sure. There is no upgrade to or from beta releases. Beta releases are for testing only and it is not recommended to run them as your main or secondary operating system." Read the rest of the release announcement for further information and screenshots. Download (MD5) the live DVD image from SourceForge: linux-lite-4.2-beta-64bit.iso (1,342MB, torrent, pkglist). Linux Lite is a beginner-friendly, desktop distribution based on Ubuntu's long term support (LTS) versions. The project's developers have published a new development snapshot, Linux Lie 4.0 Beta, which is based on Ubuntu 18.04 and introduces several changes: "This Beta marks the beginning of Series 4.x Codename Diamond. The main changes in Linux Lite Series 4.x include a new icon and system theme, Timeshift for system backups, Shotwell to manage and perform basic edits on images, MenuLibre to manage menu entries, new Lite applications including Lite Desktop that manages common icons on the Desktop, Lite Sounds to manage system wide sounds, and many of our existing applications have been updated. See below for all the changes: Minimum recommended specs have been raised slightly to more realistic levels (RAM, CPU). There are no more 32-bit ISO releases. If you still require a 32-bit OS due to hardware limitations, Series 3.x is supported through to April 2021. Xfce PulseAudio plugin, has been added to the system tray for highly customizable options regarding volume management." More details and screen shots can be found in the project's release announcement. Download (MD5): linux-lite-4.0-beta-64bit.iso (1,311MB, torrent, pkglist). Jerry Bezencon has announced the release of Linux Lite 3.8, an Ubuntu-based distribution featuring the lightweight Xfce desktop. "Linux Lite 3.8 Final is now available for download. There have been a number of changes since the 3.6 release. This is the last release for Series 3.x. Linux Lite 4.0 Final will be released on June 1st, 2018. The changes for Linux Lite 3.8 include: more support for LibreOffice; regional support for DVDs; a font viewer and Installer; we now have our own Google-based search page as the home page in Firefox. We've also added TLP for Laptops to Lite Tweaks. We've added a Thesaurus (synonyms) to LibreOffice for the US English language. If you have DVDs that are from a region other than your own, you can now easily change the region so that the DVD will play in VLC. Insert your DVD, open a terminal and type 'regionset', then follow the on-screen instructions." Further information and screen shots can be found in the project's release announcement. Download (MD5): linux-lite-3.8-64bit.iso (1,027MB, torrent, pkglist). Jerry Bezencon has announced the availability of the beta release of Linux Lite 3.8, a beginner-friendly distribution featuring the Xfce desktop. It is based on Ubuntu 16.04 LTS. "Linux Lite 3.8 beta is now available for testing. There have been a number of changes since the 3.6 release. This is the last release for the 3.x series Linux Lite 3.8 final will be released on February 1st, 2018. The changes for Linux Lite 3.8 include more support for LibreOffice, regional support for DVDs, a font viewer and installer and we now have our own Google-based search page as the home page in Firefox. We've also added TLP for laptops to Lite Tweaks. We've added a Thesaurus (synonyms) to LibreOffice for the US English language. If you have DVDs that are from a region other than your own, you can now easily change the region so that it plays in VLC. We've added a font viewer to make viewing and installing fonts easy." Read the rest of the release announcement for more details and screenshots. Download (MD5): linux-lite-3.8-beta-64bit.iso (1,024MB, torrent), linux-lite-3.8-beta-32bit.iso (1,043MB, torrent). Jerry Bezencon has announced a new release of Linux Lite, a beginner friendly Linux distribution based on Ubuntu and featuring the Xfce desktop environment. The new version, Linux Lite 3.6, makes it easier to select nearby software sources for faster downloads and includes a new way to search through documentation. "Linux Lite 3.6 Final is now available for download. There have been a number of changes since the 3.4 release. In this release, we introduce two major new features. Firstly, Lite Sources is a repository selector that allows you to easily select a software repository nearest to you. When new versions of Linux Lite branded applications are released, you'll now get much faster download speeds thanks to Lite Sources. The second newest feature for Linux Lite 3.6 is the inclusion of both an on-line and off-line search engine for the Linux Lite Help Manual. Search results are highlighted to allow you to easily find the help content you need fast." Details on how to use these features, along with screen shots, can be found in the project's release announcement. Download (MD5): linux-lite-3.6-64bit.iso (1,000MB, torrent, pkglist).